Was looking at asking for one of these for the missus to buy as an XMAS present and it looks like they've gone down in price a little on Amazon so we've pulled the trigger! Perfect for my HTPC I hope and I've read it works great with a Steam Link - I'll test this when Santa comes to our home. I'll also give it a quick test on my Shield Android TV too. The new era in PC gaming has begun. The ROCCAT Sova Gaming Board has finally arrived. For decades the living room has been the near exclusive domain of console gaming. Millions have enjoyed playing on the couch, experiencing the casual ease of plug-and-play fun that comes with it. While smaller PCs and various streaming technologies have cracked the door slightly over the years, Sova kicks that door wide open. 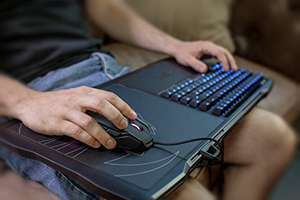 Truly bridging the gap between desk-and-chair PC gaming and living room play, Sova provides the vital key ingredient every PC gamer has lacked who wants to experience their favorite games from the comfort of a couch or chair via PC, Steam machine, or streaming device. You already own everything you need to get started - all that’s left to add is the Sova. Oh right, did it come with the mouse before? Yeah its never come with the mouse - Only the keyboard. Yeah, I put that on there in case anyone expected one too. I already have a Roccat Lua spare ready to use with mine. Can somebody please enlighten me? To me this looks like £99 for a keyboard. Yes it is. But it is far from the most expensive keyboard out of there. Generally mechanical keyboards are not cheap (with regards to the £129.99 version). You can use any USB mouse with it so no issues there. I have one of these. Very please with it! I believe it has a modular top which can be moved around - so the keyboard and mouse pad can change sides. I believe it has a modular top which can be moved around - so the keyboard …I believe it has a modular top which can be moved around - so the keyboard and mouse pad can change sides. One of the comments on Amazon says right hand only. You probably also heard sitting on your arm until it goes dead makes it feel like it's someone else's? This keyboard missing so many keys thou. It doesn’t. I own the membrane version and the keyboard is fixed in. Can somebody please explain how 30% of £159.99 is £30 and 20% of £119.99 is £20? Is this because of Brexit? Looks like Amazon have taken another tenner off of each model! Mouse on steam link is Laggy. Any solution around this?